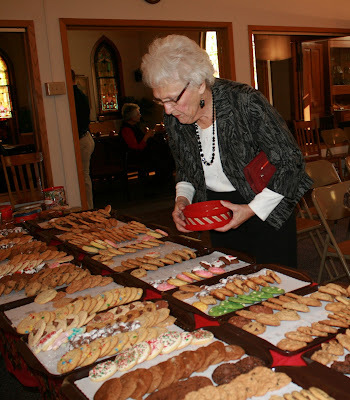 Frances Becwar ponders the vast array of cookies at the Exeter United Methodist Cookie Walk and Dried Fruit and Nut Sale. The Exeter United Methodist Women held their annual Cookie Walk and Dried Fruit and Nut Sale last week. 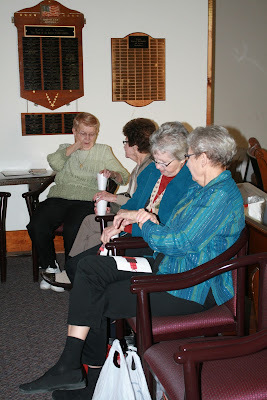 Customers enjoy choosing cookies and then enjoy free refreshments along with some wonderful fellowship. Here enjoying some visiting time clockwise from the middle left Shirley Taylor, Darlene Becker, Jo Koca and Rose Filipi.